Choker style all-gold neckpiece paired with a classic red and gold blouse. Rituja’s Pearl, Kundan and gold multi-layered necklace with a beige blouse and blue lehenga. Divya’s maroon Sabysachi blouse paired with stunning polki jewellery. Urvashi’s bright red lehenga accessorized with a two-tier gold neckpiece and a matching mathapatti. 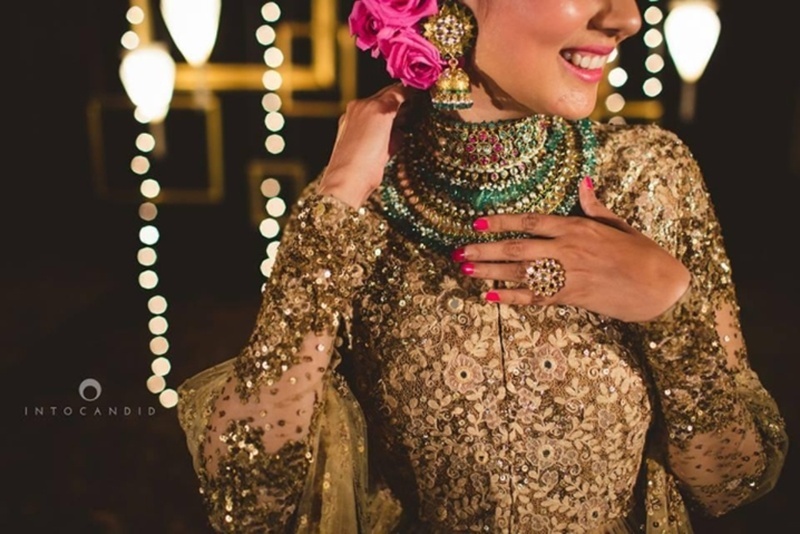 This bride’s traditional blouse and polki jewellery. Apsara’s gorgeous diamond and pearl neckpiece with a gold lehenga. This jade, diamond and gold choker paired with a glittering gold outfit.